Admission to the Noguhci Museum on Long Island City is free on the first Friday of each month, year round. From May through September, first Friday hours are extended from 5:00 to 8:00 p.m. and there’s a cash bar available. 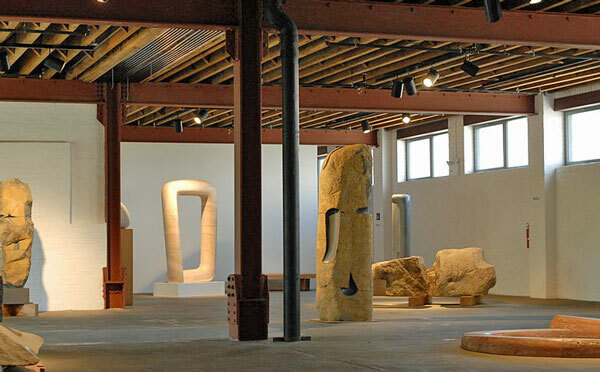 The Noguchi Museum was founded and designed by Japanese-American artist Isamu Noguchi. The museum includes two floors of galleries, plus an outdoor sculpture garden. Noguchi (1904 – 1988) is known for his work in contemporary sculpture, public art, stage sets, and modern furniture designs. There are several Noguchi public art pieces on display in NYC, including the Red Cube sculpture in Lower Manhattan. Free gallery talks are given at 2:00 p.m..
There’s a shop and cafe on site, where you can get a snack and browse Noguchi-designed items available for sale. The Noguchi Museum is open Wednesday – Friday 10:00 a.m. to 5:00 p.m. (with extended hours until 8:00 p.m. on the first Friday of the month May through September); and Saturday & Sunday from 11:00 a.m. to 6:00 p.m.. The museum is closed on Mondays & Tuesdays. Regular general admission is $10 for adults, $5 for students (with valid ID) and seniors (65+). NYC public high school students with a valid ID, and children under the age of 12 are admitted free. Admission is free on the first Friday of each month. NOTE: Information is accurate to the best of our knowledge at the time of publication. Please visit the museum website to verify. The museum is located in the Long Island City neighborhood of Queens. The address is 9-01 33rd Rd, Long Island City. The building is at the intersection of 33rd Road and Vernon Boulevard. Visit the museum website for detailed directions on how to get to the museum.